Lighting a Fire: More from Daily 5! 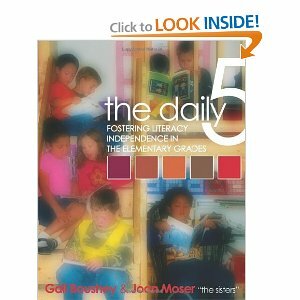 I have heard some people say that the structure of Daily 5 doesn't allow for direct instruction. This opinion has always interested me- especially because I am leaving tomorrow for a workshop with Anita Archer (the master of explicit instruction). I can see the benefits of direct, explicit instruction and I can see the benefit of giving students the time to practice reading. Gail and Joan actually addressed this concern during the workshop and I was so glad that they did! That is 4 separate times throughout the day where the teacher is directly instructing students on reading strategies. In other words, 20% of the day is direct instruction while 80% of the day students are practicing reading. For me, this makes sense. Have you heard of the 10,000 hour rule? This idea comes from Malcolm Gladwell and his book Outliers. Basically, it means that experts become experts because they practice more than other people. Specifically, "experts" practice a skill for around 10,000 hours. Don't we want our kiddos to become expert readers? I know that my students don't always have opportunities to read at home. Their house might not be a safe place, they might not have access to books or they might be moving from place to place each night and can't keep track of books. If I want to close the achievement gap and I want my students to be able to have the same opportunities as any other child their age, then I need to give them the time to practice at school! My plan for the upcoming school year is to implement the structure of Daily 5 during my 90 minute reading block. We do ability group our students (which I know is a "no-no" according to the sisters) and that has worked for my team and I in the past. During my block I will hold 4 7-minute mini lessons and 3 20-minute Daily 5 rotations. The students don't have to do each option every day. In fact, read to self and work on writing will be 2 required rotations each day. The third rotation will be their choice. They will also be able to choose which order they complete their rotations. I've never heard of Anita. Come back and teach us. Enjoy! Thanks for the info on Daily 5. We do not use it at our school. Good luck with the Anita Archer conference! Great blog. I am a new follower. I just found your blog! I'm interested in doing Daily 5 too! I've been participating in a book study this summer...oh, and we ability group too. It does have its benefits! I'm a new follower and a fellow third grade teacher!